Skiing is a treasured family past time for many. Old or young, family members of all ages and abilities can enjoy the fun and beauty of snow-capped mountains across the globe. Whether your favorite part of the vacation is hitting the slopes, taking in the breathtaking views, or sipping hot chocolate in the lodge, these luxury ski resorts have something for everyone. And the adventure in and around these amazing accommodations isn’t limited to just skiing. Many of these resorts offer year-round fun for parents and children alike. Let’s explore some of the world’s most luxurious ski resorts that accommodate families of every size and ability. When you think of skiing does Colorado come to mind? With over 150 ski resorts calling Colorado home at one time or another, it’s no surprise that one of the country’s most luxurious resorts is located in this Rocky Mountain region. If you’re an avid skier looking for a challenge, then visiting Vail should be on your bucket list. With over 5,200 acres of ski and snowboard terrain and seven Black Bowls, the area is every ski enthusiast’s dream. If you’re looking to take a break from the slopes, there’s plenty to do in the local area. Finding things to entertain the kids won’t be any trouble at all. Vail experiences over 300 days of sunshine each year, meaning there’s an abundance of outdoor activities for the whole family. The summer months provide warmth and the opportunity for an array of sports from golfing and fishing to hot air balloon rides! If shopping is your pleasure, visit Vail Square where you’ll find galleries, boutiques, hot chocolate, and an outdoor ice rink. After a full day of shopping or skiing, parents can relax at either the Arrabelle Spa or the Lodge at Vail Spa. Both offer treatments using only organic ingredients. If you’re looking to travel during your family ski excursion, what better place to visit than Switzerland. With expansive mountains and gorgeous landscapes, this region is home to some of the most luxurious ski resorts in the world. And Badrutt’s Palace in St. Moritz is one of its finest. The building itself is beyond anything you’ve ever seen. The history of the palace dates back to 1896 and it’s visible throughout. With suites offering both mountain and lake views, guests can choose between several double room options. Enjoy afternoon tea or a decadent dinner at the hotel’s Grand Hall or the Full House. Dining with the whole family? Chesa Veglia has something for everyone. While you and your partner hit the slopes or enjoy some local shopping, Badrutt’s Palace will keep your little ones safe and entertained. The activities and opportunities available for children at the palace are endless. The Kids’ Club Palazzino is designed for children ages 3 to 12. Kids can will love playing in the outdoor area, tennis courts, swings, sandpit, and ice skating rink. Organized activities include horse carriage rides, trips to the fire department or airport, bike tours, cooking and baking lessons, crafts, dancing, and gymnastics – among many more! The last thing your kids will be is bored at Badrutt’s Palace. The highlight of your child’s trip might be the Kids’ Disco party held in the classic King’s Club. Happy kids make for happy and relaxed parents. Located in picturesque Beaver Creek Colorado, the Beaver Creek Lodge has been voted one of the top 40 resorts in the West. And once you pass through the entrance and discover everything this luxurious lodge has to offer, the reasons are clear. With suites that offer both a bedroom and living area, families will have plenty of room and space to relax and unwind after a long day of outdoor fun. The kids can warm-up by the suite’s fireplace while mom and dad prepare snacks and even dinner in the suites’ kitchenette. Don’t feel like cooking? No problem. Experience a revolutionary experience at the Beaver Lodge Revolution restaurant that offers a variety of meats, flatbreads, and homemade sauces. Activities at the lodge are abundant. Winter sports include skiing (of course), snowmobiling, ice skating, and dog sledding. Traveling to Beaver Creek in the summer months? You’ll be pleased to know warm weather activities range from horseback riding and fishing to river tubing and kayaking. If relaxing is your top priority, Beaver Creek has you covered with a spa, art galleries, and shopping. Kids will love the indoor pool, hot air balloon rides, and 18-hole mini-golf. Traveling with an infant? Beaver Creek Lodge provides cribs and Pack-n-Plays upon request and free of charge. With ten provinces, three territories and major cities like Vancouver and Toronto, Canada is a mecca for diversity and vacation destinations. The Fairmont Chateau, surrounded by the Victoria Glacier and picturesque Lake Louise, offers visitors breathtaking views and equally luxurious accommodations. Located in Alberta’s Banff National Park, the Fairmont Chateau has 552 rooms including suites, guestrooms, and specialty rooms. When traveling with family, the Fairmont offers activities and events for adults and children alike. If you’re visiting the area during the Christmas holiday, enjoy a horse-drawn carriage ride, Santa’s Christmas workshop and gingerbread house decorating. Like any luxury ski resort worth visiting, the Fairmont Chateau offers a world-class spa for adults. Couples can enjoy a body scrub, massages, facials, and over 20 other treatments in this oasis of relaxation. While mom and dad are unwinding, the kids can choose from a variety of awesome programs. For children ages 8 and up, the Mountain Adventure Program includes hiking and canoeing in the summer months and snowshoeing and cross-country skiing in the snow. If you’re traveling with younger kids, the Kid’s Camp accommodates children starting at age 5.campoutsl enjoy campouts, pajama parties, scavenger hunts, and creating stuffed animals among countless other outdoor adventures. Babysitting is also available for children of all ages. We end our journey in France. The L’Apogée Courchevel is not only aesthetically beautiful but offers visitors a unique and unforgettable experience. With its ski-in and ski-out ramp, guests can easily access the wide-range of accommodations and activities from boutiques and shops to the resort’s fitness center and spa. Traveling in style with kids has never been easier. This beautiful resort offers large, interconnecting rooms with upwards of 5 bedrooms to accommodate families of any size. Parents can utilize the penthouse for seclusion. The L’Apogée kids’ club ambassadors take pride in offering your children an amazing experience during their visit. With a variety of VIP 1850 options, kids young and old will engage in age-appropriate activities and adventures. The Mini-VIP 1850 is an oasis for youngsters where ambassadors will entertain and supervise while also helping children make chocolates, perfume, and even jewelry. Kids will delight in play time in the snow and tasty snacks made from fresh, local produce. Older children will love the Freestyle 1850. Here, teens can listen to music, use the internet, play video and computer games, and participate in dance parties. This club is designed for kids ages 11 to 15. Movie nights are made available, as well as table tennis. All children will love hitting the slopes for dog sled rides and skiing. Parents can have their own fun outdoors or in the resort’s luxurious spa. This French getaway is fun for the whole family. 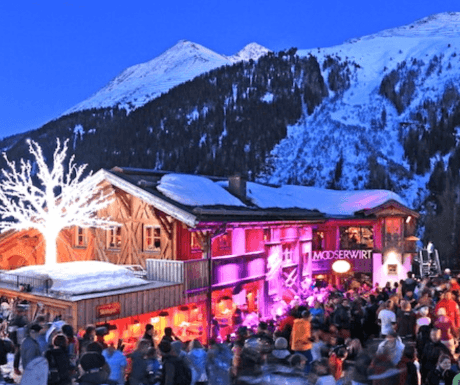 Now that you know about these luxurious ski resorts that span four countries, you can plan an unforgettable and enjoyable excursion for the whole family. Whether all members love the slopes or only some, these resorts offer adventure and entertainment that will create a once and a lifetime experience for all. April Sutphen is the Creator and Editor of Honest Mom. No Four Seasons Whistler, one of the world’s finest family ski resorts….interesting.